In today’s increasingly open and competitive global economic environment, the performance of countries — best measured in terms of per capita income (as a proxy for welfare) and growth – – depends significantly on the links they establish with the rest of the world economy. Key among these are linkages generated through firms that undertake international production, along with flows of trade, technology and capital. Foreign direct investment and non-equity modes of participation by TNCs in international production create opportunities for countries to strengthen their capacities to produce, to reach and expand the markets for their products, and to adapt their economies to changing conditions. Part Two of the World Investment Report 1995 looks at key aspects of the relationship between FDI and the competitiveness of firms, and the implications of that relationship for the economic performance of host and home economies in which those firms operate. An increasing number of firms in many countries are now subject to integrated corporate strategies that span more than one country and involve not only headquarters but also domestic and foreign affiliates: they constitute parts of transnational corporate systems. Firms comprising these systems are becoming increasingly specialized with product mandates being given to individual firms and a tendency to locate discrete parts of the value-added chain in any part of the world where it yields the maximum benefit to the system as a whole. The intra-firm international division of the production process has become a necessary — if not imperative — element for firms that wish to compete in the international arena. Given the liberalization of trade, FDI and technology flows, it becomes increasingly difficult for firms to withdraw behind various types of barriers into the safe havens of their home markets. Competition is everywhere. All markets are increasingly being contested by a whole range of international economic transactions. Firms wishing to remain competitive need to maximize their efficiency, drawing on three principal sources: a portfolio of proprietary (or firm-specific) assets; a portfolio of locational assets; and the managerial expertise to exploit these portfolios, with a view towards converting global inputs into outputs for global markets as profitably as possible. … with significant implications for countries’ economic performance. The forces driving TNC systems to enhance their competitiveness have important implications for countries’ economic performance. To the extent that these firms bring with them tangible or intangible resources (including capital, research and development, technology and organizational and managerial practices) that increase the capacity of a country to produce a greater quantity or improved quality of goods and services, the performance of the country will be affected positively. Positive effects can also result from the expansion of market access that TNCs can bring about, directly or indirectly, as a consequence of intra-firm transactions or a greater ability to reach national and international markets, as well as from economic restructuring fostered by TNCs. To the extent that governments make it difficult for firms to develop fully their three principal sources of efficiency, they handicap them in international competition, ultimately harming global welfare and, under certain conditions, their own countries’ welfare as well. Capital. Corporate systems generate savings in the form of retained profits. Estimates based on United States data suggest that the total profits generated by foreign affiliates worldwide were some $175 billion in 1994. The part of those profits that is reinvested is significant — in the case of the United States, it amounts to over half. The remainder is repatriated for distribution to shareholders. In other words, TNC systems also serve as conduits for the circulation of capital (and related payments) among their units via equity flows, intra-company loans and repatriated earnings. Capital generated internally can be deployed anywhere in a TNC system, offering advantages in terms of flexibility in project financing and minimizing transaction costs. Innovatory capabilities, technology and skills. Corporate systems are an important source of innovation, generating technologies — and, in the process, technological capabilities and skills — that are key to improving a company’s competitiveness. Some four-fifths of global civilian research and development is undertaken within TNC systems. The United States, the largest outward direct investor, saw a doubling of research-and-development expenditures by TNC parent firms and an increase by three-and-a-half times in such expenditures by foreign affiliates during 1982-1992. Patent data also suggest that the world’s largest industrial firms, most of which are TNCs, account for around half of the world’s commercial inventions. And collaborative strategic alliances for the development of new technologies are on the rise. An increasing share of research and development undertaken by TNCs is accounted for by foreign affiliates, but different indicators give different pictures of the magnitudes involved and the extent to which this trend has gained in importance in recent years. For United States TNCs, the share of research and development performed by (majority-owned) foreign affiliates increased from 9 per cent in 1982 to 12 per cent in 1992 (measured by expenditures).Patent data not only confirm this trend but also suggest that the share of research and development undertaken by foreign affiliates of TNCs from a number of countries may be even higher. While research and development that takes place outside the home countries of TNCs is located largely in developed economies, increasingly, it is also being located in developing economies and economies in transition. Principal among the forces behind this trend are competitive pressures driving firms to tap into pools of knowledge, expertise and skills wherever they are located, capitalizing on the transnational nature of TNCs. The availability of the requisite talent and capabilities in a number of developing and transitional economies at a much lower cost, combined with the liberalization of regulatory frameworks and (for some industries particularly important) improvements in the protection of intellectual property rights have fostered this trend. There are, however, retarding forces, especially a “stickiness” resulting from an established pattern of locating research at home. But the self-interest logic of a TNC system suggests that research and development (like manufacturing before it) will increasingly be performed where this can be done most efficiently — and that should mean more and more geographical dispersion within TNC systems.Beyond being conduits for the dissemination of innovatory capabilities, TNC systems offer privileged access to technology for their member units. An estimated four-fifths of global cross-border flows of royalties and fees (a proxy for technology flows) take place within TNC systems. Integrated research-and-development networks with cross fertilization through two-way flows of information and skills between parent firms and foreign affiliates are, however, prevalent mainly in the developed world where conditions for their operations are more likely to exist. For the majority of developing countries, as well as many developed economies, it is usually a transfer of production technology that takes place, from the parent firm to its foreign affiliates. Organizational and managerial practices. Transnational corporations are also an important source of organizational innovation and the generation of new and more efficient managerial practices. Drawing upon the ideas of creative individuals within their own corporate sphere and upon knowledge generated outside — e.g., in business schools and managementconsulting firms — firms constantly seek to modernize their organizational and managerial practices, in order to gain firm-specific advantages and as a way to improve the efficiency of their operations. The transnational nature of their organizations creates particular demands for sophisticated transnational and cross-cultural management and organization. The very transnational nature of the corporate system facilitates this, as any part of the system is a potential source of improvements. Moreover, many TNCs typically operate in the forefront of technology and constantly need new practices to respond to the changes in production methods that this requires. The TNC system provides parent firms and foreign affiliates privileged access to any new organizational and managerial practices developed elsewhere in the system, although the actual dissemination of such practices depends upon the characteristics of the individual TNC system concerned. The role that TNCs have in the generation of these competitiveness-enhancing resources gives these firms a leading edge in the globalizing world economy. And, being part of a TNC system may be necessary for obtaining access to some of these resources. While the units belonging to TNC systems have privileged access to the assets available through these systems, firms linked to them can have advantageous access to the same assets. This is particularly apparent — and important — in the area of technology. For example, collaborative agreements between TNC systems and indigenous firms can enhance the competitiveness of all the firms involved, by taking advantage of technological or knowledge complementarities. Similar arrangements may be made between TNC systems and local research institutions. Some foreign affiliates, for instance, sponsor research and development carried out by indigenous firms or institutions. As far as production technology is concerned, backward linkages (including through non-equity arrangements) with TNCs are an important means of acquisition of new or advanced technology by indigenous producers. Such arrangements can contribute substantially to competitiveness and the creation of national technological capabilities, as the experience in several East Asian countries attests. Even if the resources available in TNC systems are not transferred through linkages, international production can enhance the efficiency of indigenous firms through spillovers, externalities and competition effects — provided that the gap between TNCs and domestic enterprises is not so large that the latter are overwhelmed by the former. For instance, FDI can act as a catalyst for investment by other (including domestic) firms in a host country by signalling investment opportunities. It can also induce technological change and productivity improvements — through demonstration effects, turnover and hiring of former TNC employees, and increased competition. Key organizational and managerial practices are also spread as indigenous firms imitate the practices of foreign affiliates that compete with them or that they consider better managed. The very presence of foreign affiliates is often sufficient to act as a catalyst for change in management methods, as seems to have been the case with the widespread adoption of qualitycontrol practices. The adoption by many Brazilian companies of ISO standards, viewed as a mark of quality and international competitiveness, is a case in point. … all of which can contribute to enhancing the performance of host and home countries in which international production is located. It is an advantage of FDI that it provides a package of wealth-creating assets that become available directly for use in production activities and hence can enhance the economic performance of countries. Although the wealth-creating assets that are part and parcel of FDI may be acquired separately (provided that countries have the ability to do so), it is precisely because it comes as a package that FDI is increasingly welcomed by all countries. Capital. For host economies, inward FDI that is greenfield — i.e., that establishes new facilities — adds to the capital stock and increases output and employment. Although FDI flows form a relatively modest proportion of gross domestic capital formation, not exceeding 10 per cent in most host countries, FDI capital is assuming increasing importance for developing countries. The contribution of FDI made through acquisitions or privatizations (rather than the creation of new enterprises) — by far the most common form of FDI in developed countries — is not as obvious. But it, too, may benefit the host economy if the domestic firms that are taken over become more competitive or would have closed down otherwise. Both kinds of FDI can induce a further expansion of the host country capital stock through sequential investments that FDI often triggers, and through associated FDI typically undertaken by firms that are suppliers or distributors for foreign investors.There seems, however, to be an asymmetry between inward and outward FDI, considered separately, as regards their impact on the capital stock of countries. A key question as regards outward FDI is whether the investment takes place at the expense of domestic investment in the home country. If the build-up of foreign affiliates’ assets is financed through cross-border flows of capital, and if raising this capital involves the crowding out of home-country investments, then outward FDI would affect domestic capital formation adversely. There seems to be little evidence, however — at least for major home countries — that such crowding out takes place. On the other hand, the indirect effects on homecountry investment from the remittance of profits or increased demand for exports must also be taken into account. Moreover, domestic factors of production may be released for more productive use when outward FDI takes place, improving long-term economic performance through restructuring. Innovatory capabilities, technology and skills. Given the dominant role of TNCs in the innovation of new products and processes, inward FDI (and non-equity arrangements with TNCs) are an important source of new and advanced technologies and skills. Foreign direct investment that involves the setting up of research-and-development affiliates also strengthens the innovatory capacities of host countries. At the same time, outward FDI can strengthen home countries by allowing firms to access overseas research-and-development capabilities and technologies otherwise difficult to obtain and to minimize costs of technological development. As research-and-development dispersion by TNCs increases, the size of a home country’s technology base may shrink and some technological capabilities may diminish or disappear as a result of an international division of labour in research and development. The implications of these changes must be balanced against the returns in terms of repatriated earnings from the worldwide exploitation of the technologies generated and against the effect they have on the competitiveness of the firms involved. Organizational and managerial practices. The adoption of more efficient organizational and managerial practices by units of TNC systems can improve productivity in an economy directly as well as through the linkages, spillovers and externalities mentioned earlier. The strong competitive position of the United States manufacturing industry in the interwar period and thereafter, as well as the sustained competitive strength of Japanese manufacturing industries in recent decades, can be attributed in some measure to the managerial practices pioneered by the firms of those countries; many of these innovators have been TNCs. 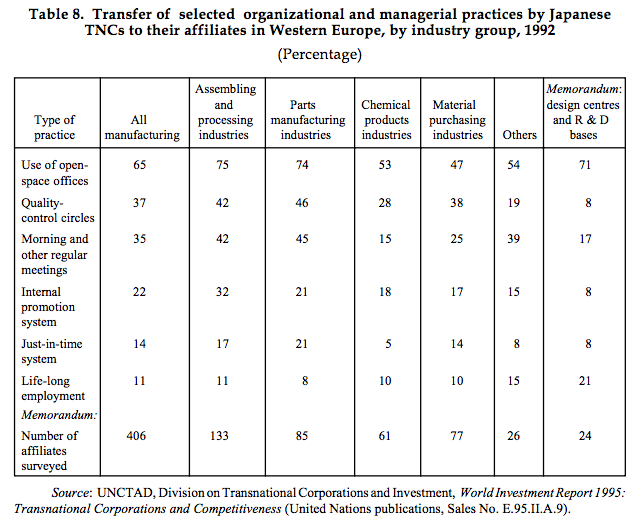 Inward FDI has (along with other channels of transfer of knowledge) acted as a conduit for the spread of Japanese organizational and managerial practices to other countries (see table 8). 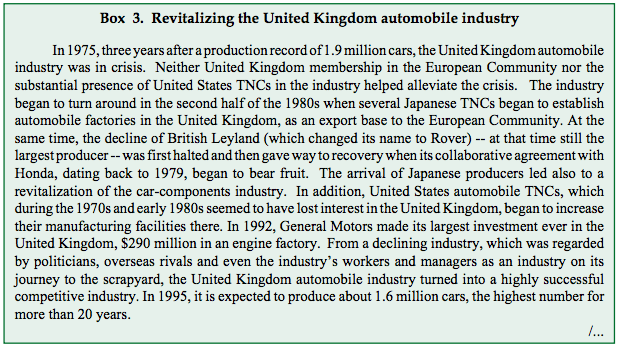 The comeback of the United States automobile industry and, more generally, the recovery and growth of United States manufacturing productivity is due partly to the successful adaptation of Japanese organizational and managerial practices. Similarly, in developing host countries, foreign affiliates have often acted as conduits for the transfer, and as catalysts for the adoption, of numerous improvements in organization and management by indigenous enterprises, presumably contributing to a more efficient use of resources and improved performance of the economy as a whole. The competitiveness of firms depends not only on their ability to obtain access to assets that complement and enhance their capacities to produce goods and services, but also on their ability to access markets that are large enough to exploit those assets fully and most efficiently. Foreign direct investment strengthens the capabilities of TNCs to reach international markets not only through cross-border trade but also through the sales of foreign affiliates (“establishment trade”). The latter allow TNCs to secure markets for goods and (especially) services that are impossible to reach without proximity to customers, to expand markets for goods and services that are difficult or costly to service from a distance and to respond rapidly to new or changing customer tastes and market conditions. Equally important, FDI allows firms to build intra-firm networks of trade that link production units within TNC systems and provide them with privileged access to the rest of the system. 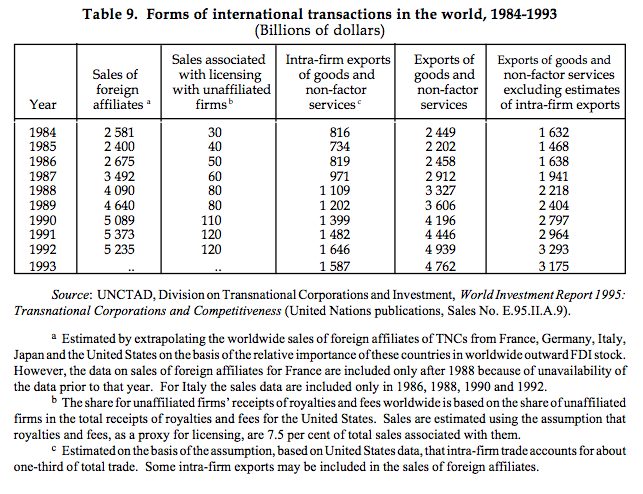 These intra-firm activities are estimated to comprise one-third of world trade, or approximately $1.6 trillion of exports in 1993 (see figure 3 and table 9). The resulting efficiency benefits to the TNC system stem from reduced transaction costs as compared with arm’s length trade and from economies of scale and scope. From a country’s point of view, these same arrangements may, however, give rise to concerns over restrictive business practices and transfer pricing which need to be addressed. 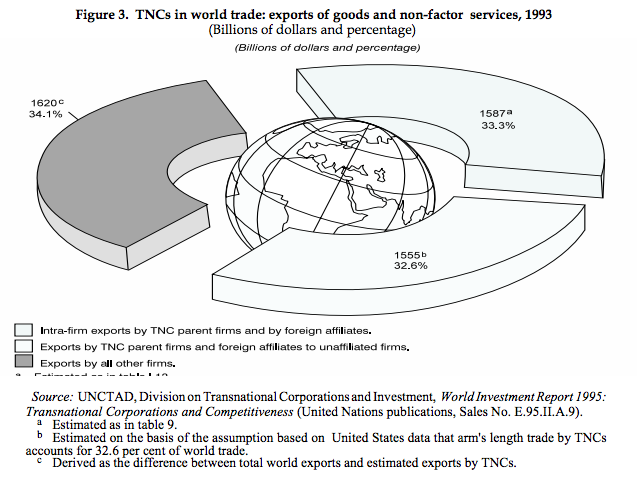 Beyond such intra-firm trade, TNCs also sell to non-affiliated firms abroad, and such sales are estimated to account for about another one-third of world exports of goods and services. Furthermore, the markets served by establishment trade must also be taken into account. The efforts of TNCs to expand their sales and organize their production efficiently create market opportunities for other firms in host and home economies, if these other firms are linked to TNC systems. This applies especially to suppliers of parts and components and of producer services. It also applies to firms that utilize transnational trading corporations, which have played a particularly important role in providing suppliers of primary or manufactured goods with access to international markets. Thus, firms not being members of TNC systems, but being linked to them, can have advantageous access to the sizeable markets worldwide served by TNC systems, an opportunity that may give them a competitive edge over their rivals. … with, again, implications for the performance of host and home countries. What does this mean for the economic performance of host and home country economies? For host countries, and especially developing countries, inward FDI not only contributes a package of resources that are often complementary to domestically available resources and hence expand their production capacities, but also expands the markets for output. Given a competitive environment, and one in which domestic producers are not simply overwhelmed by TNCs, inward investment should thus contribute to raising output of host countries directly as well as through linkage and competition. Where the last of these conditions is lacking, in particular, and one or more industries in a country become exclusively comprised of foreign affiliates, the sharing of the benefits between the host country — i.e., its consumers (through prices), producers (through spillovers and eventual capacity-building), labour and other domestic resources (through wages and other factor returns) and government (through fiscal revenues) — and TNCs become of particular importance. Maintaining competition becomes key. A particular contribution by foreign affiliates to markets of developing economies relates to export expansion: there is evidence that foreign affiliates in developing countries often have high export propensities and tend to be more export-oriented than domestic firms, especially in manufacturing. Their high export propensities are however accompanied, particularly in the earlier stages of investment, by relatively high import propensities which can exacerbate foreign exchange shortages in the short run. But, in the longer run, the overall high trade orientation of foreign affiliates can strengthen the linkages of host countries to the world economy, with benefits in terms of their trade performance as well as output growth (see box 2). The relationship between outward FDI that strengthens market access for TNCs and the performance of a home economy is less straightforward. This is because outward FDI could, under certain circumstances, displace (actual or potential) domestic investment, and affect output and employment in the home country adversely, particularly in the short or medium-term. Empirical evidence varies in this regard, although the balance of evidence for FDI in general seems to suggest that the effects of outward FDI on the level of home country economic activity are marginally positive. In addition, available evidence suggests that outward FDI as a whole has a positive effect on home country exports, while, in the aggregate, also resulting in increased imports as well as a changing pattern of trade. It contributes, moreover, to income generation for the home economy through repatriated income and strengthens innovatory capacity on account of the abilities of TNCs to finance and sustain high rates of research and development and to keep abreast of technological change. Finally, even in the absence of these effects, home countries would still benefit from outward FDI if that helps their TNCs to retain their markets and, hence, to survive. The access to various resources and markets provided by TNCs, and its effects on the economic performance of countries, can produce — in interaction with domestic factors — performance-enhancing effects that go beyond the sum of the individual effects. In particular, TNCs can enhance a country’s ability to restructure its economy which, in turn, leads to higher productivity and income. The contributions that TNCs can make in this respect occur simultaneously at the firm, industry and sectoral levels, independently from the level of development of the host and home countries involved (see box 3). Sectoral restructuring of an economy, from the primary sector, especially agriculture, through manufacturing to services. Restructuring within a sector, e.g., restructuring of manufacturing industries from lowproductivity, labour-intensive (and typically low-technology) light industries to highproductivity (and usually high-technology) knowledge-based industries. A shift within an industry — from low-technology, low-value added goods or services to higher-technology, higher-value-added ones. Transnational corporations can — and do — facilitate restructuring of home and host countries by introducing new industries or activities that would be unlikely to emerge from purely national enterprises alone or from upgrading existing ones. They can do this because they can supply a package of tangible and intangible assets, reinforced by privileged access to the wider pool of resources residing in their systems as a whole, and by linking their resources with those available in the countries — host or home — in which they are established. Firms can play this role through various forms of involvement, ranging from wholly-owned foreign affiliates through joint ventures to licensing and subcontracting agreements. The central and common characteristics of all these forms is that TNCs retain control over key assets, and hence over key parts of the production or distribution process (or both). Nowhere are the phenomena related to the positive role that TNCs can play in industrial restructuring more clearly visible than in parts of Asia, a region undergoing rapid structural transformation. It is a restructuring that involves, to various degrees, TNCs in many of these countries’ manufacturing industries. This role can be seen particularly in Indonesia, Malaysia, the Philippines and Thailand, but increasingly also in China and Viet Nam. But even in countries that are considered textbook cases of successful restructuring and development based principally on indigenous capabilities — Japan, the Republic of Korea and Taiwan Province of China — TNCs have played a role. 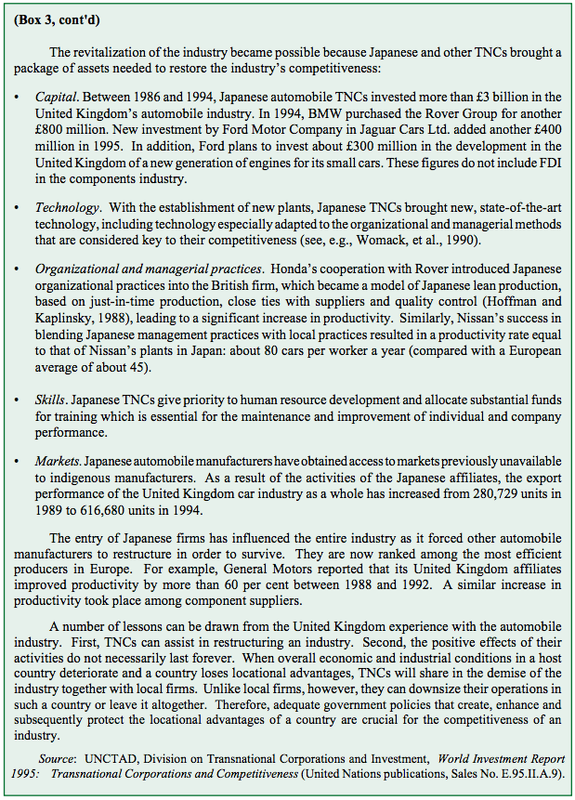 In the immediate post-war period, foreign TNCs helped turn Japanese light industries into internationally competitive industries, and Japanese automobile makers learnt the techniques of mass production in joint ventures with TNCs. This role, however, was short-lived: due to the Japanese ability to develop local capabilities, it soon gave way to looser links with foreign firms in non-equity forms which served mainly as a conduit for technology transfer. Much clearer and long-lived has been the role of the country’s own TNCs, in terms of helping restructure Japan’s manufacturing sector through outward FDI. Japan’s success in becoming a highly competitive economy owes much to its ability to restructure its manufacturing sector continuously from labour-intensive industries through resource-based heavy industries and assembly-oriented industries towards high technology industries. Outward FDI in manufacturing was important at each stage of the restructuring process (table 10). 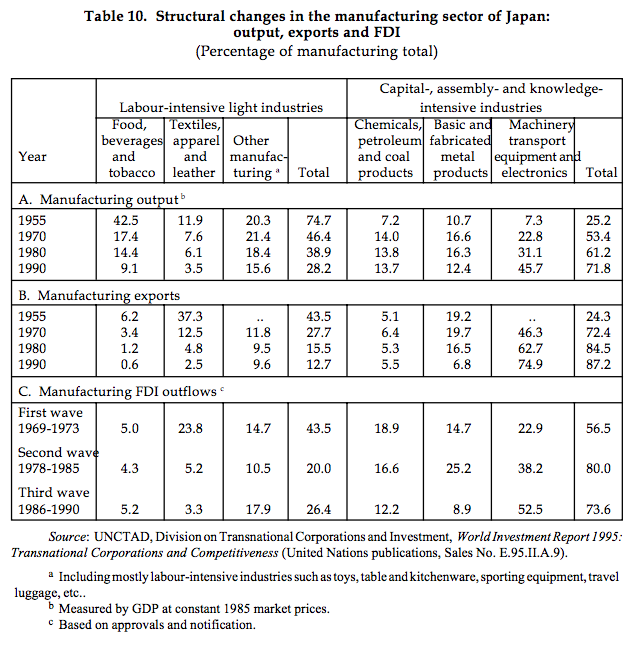 It accelerated the process of Japan’s industrial restructuring, notably by scaling down — through moving abroad — industries or activities losing competitiveness (and thus releasing resources for industries gaining competitiveness), strengthening the existing structure by acquiring abroad assets lacking at home, or lowering the cost of this upgrading by sharing these costs with foreign TNCs. At each stage of the restructuring process, some industries (or activities within industries) came under competitive pressures and had to be restructured at home or relocated abroad, or both. Some examples illustrate this process. 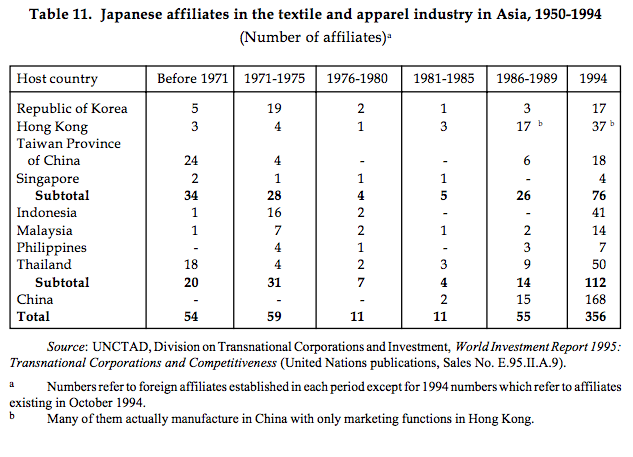 During the 1960s, competition led to the transformation of Japanese small and medium-sized companies in the textile and apparel industries into TNCs: they relocated their production to the (now) newly industrializing economies with (then) an abundant supply of cheap unskilled labour. More recently, Japan’s manufacturing FDI is on the rise again, supporting the next round of competitiveness-enhancing industrial restructuring, this time mainly to alleviate the brunt of the yen appreciation by relocating certain types of production to lower-cost countries, mostly in Asia. The activities concerned include parts and components (giving domestic assembly-based industries the benefit of cheaply imported inputs) and low-end final consumer goods such as radios, colour television sets and microwave ovens in which Japan (but not necessarily Japanese firms) has been losing its comparative advantage. By relocating assets that were no longer of use at home to neighbouring developing host countries that had a comparative advantage based on an abundance of cheap labour and certain skills — but which could not realize their comparative advantage fully in the absence of these assets — Japanese TNCs (and, for that matter, also United States TNCs) contributed to the building, upgrading and turning around of industries in the countries concerned. In particular, they turned inward-looking industries into export-oriented, internationally competitive industries, thus helping countries realize or enhance their comparative advantages. 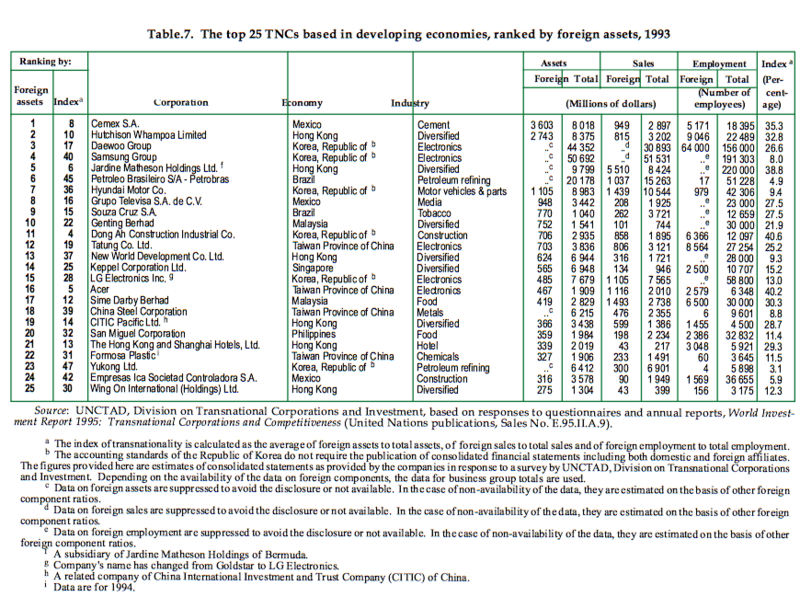 Even the Republic of Korea and Taiwan Province of China used some TNC-controlled assets in the initial phase of industrialization (as illustrated by the case of the textile and apparel industries; table 11), and more when they were moving up the ladder of industrial upgrading (as illustrated by the case of the electronics industry). The reliance on TNC-controlled assets has been higher in countries that have more limited capabilities. If a country wants to pursue an export-oriented strategy, (especially at an early stage of industrialization) TNCs can provide key assets (such as access to markets, product design or quality control) that can help to make this strategy a success. Since such key assets can be provided through non-equity arrangements as well, the role of TNCs in economic restructuring is much greater than FDI-based measures would show. Quite logically, those developing countries in Asia that successfully restructured gave rise, eventually, to their own TNCs; these began to undertake FDI initially in the developing countries of the region and later on also in developed countries. Conversely, the emergence and growth of outward FDI indicates a successful restructuring process. As a result, the newly industrializing economies involved have been taking advantage of both inward and outward FDI as agents of industrial transformation. …leading to interactive TNC-assisted restructuring in the whole region. The successful restructuring of the first generation of newly industrializing economies created new home countries (and, hence, sources of FDI). Combined with the liberalization of inward FDI policies in the region, this has led to the growing importance of FDI in the restructuring process of other developing countries of the region, first Indonesia, Malaysia, the Philippines and Thailand, and, more recently, China and Viet Nam. Successful restructuring (including in countries relying largely on their indigenous capabilities such as the Republic of Korea and Taiwan Province of China), moreover, typically leads to a greater role of inward FDI because it involves a movement towards more knowledge-based industries (such as the electronics industry) usually dominated by TNCs. Furthermore, by shifting assets from home to host countries, Japanese (and United States) TNCs and TNCs from the newly industrializing economies have linked the processes of industrial restructuring within the region, initially between Japan and the newly industrializing economies and later between these countries and other countries in Asia. This has led to an interactive TNCassisted restructuring process among an increasing number of economies of the region (described by some as a “flying geese” formation). By doing so, TNCs smooth (and speed up) the adjustment process in response to changing patterns of comparative advantage and contribute to economic growth. The extent of TNC participation — through both equity and non-equity forms — in the industrial restructuring of especially East and South-East Asia has been such that TNC activities need to be included among the factors that explain the above-average economic growth in Asia. The interactive nature of this process, and the impetus it gives to economic development in general, can perhaps be described as “tandem economic development” through interactive TNC-assisted industrial restructuring. Other regions, too, have the potential to follow Asia’s example. The countries involved were at different levels of development, with corresponding factor endowments, cost structures and local capabilities; this provided a wide range of choices for TNCs to match host country capabilities with their own. The governments involved allowed restructuring to happen, including by letting phase out some firms or industries while letting phase in others, and allowed the emergence of their own TNCs. Restructuring was to be verified by the market. An enabling framework was created, permitting TNCs to deploy their assets between the countries involved and to play their restructuring role, at least for the industries targeted by governments for upgrading; this included especially the liberalization of external transactions (particularly FDI and associated trade) and a favourable investment climate. There was demand — international or domestic, or both — for the goods (and services) produced by new and restructured industries. These conditions exist or are being established in other regions as well, including Europe (Western and Eastern) and the Western hemisphere (North America, Latin America and the Caribbean). Both regions include countries at different levels of development. While the highincome countries in these regions have been restructuring (although not always with sufficient speed, especially those in Western Europe), most middle-income countries urgently need to do so. For the countries of Latin America and the Caribbean that already have a large stock of FDI in manufacturing, the challenge is how to make this stock more dynamic, i.e., how to make the foreign affiliates holding this stock internationally competitive. (Or, to apply the metaphor used earlier: how to turn sitting ducks into flying geese.) For the countries of Central and Eastern Europe, the challenge is how to attract FDI that leads to restructuring. The enabling framework is being created in both regions as a result of the broader market philosophy adopted by the countries of the regions, which is also reflected in the liberalization of trade and investment regimes embodied in a number of regional agreements. At the same time, however, interactive restructuring in these regions is likely to differ from that in East and South-East Asia, in that it will be more market-driven than Asia’s more interventionist approach. 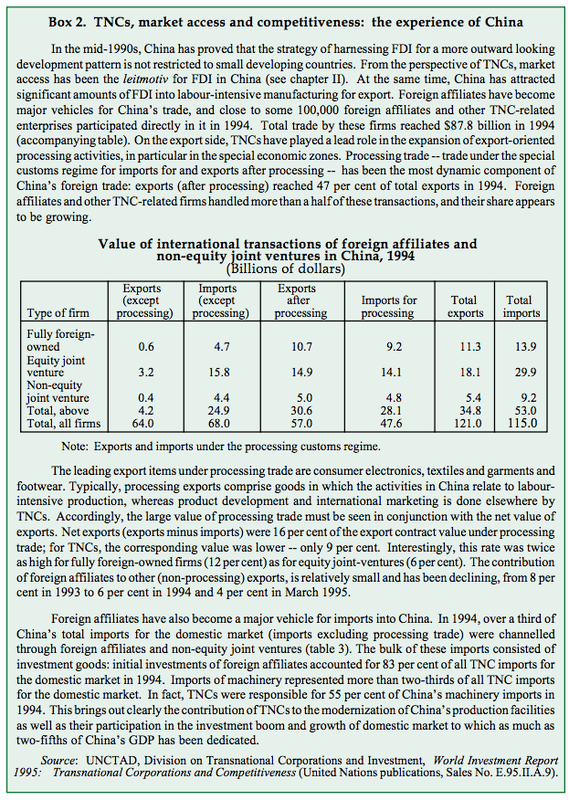 If the liberalization of international transactions, combined with differences in relative factor costs among countries, is allowed to work out its logic, TNCs would presumably deploy their proprietary assets in a manner that will contribute to TNC-assisted restructuring in Europe and the Western hemisphere as well. The beginnings of such a process may already be taking place on a limited scale in both regions, as exemplified by the TNC-driven restructuring of the automobile industry in Mexico and restructuring activities of TNCs in Hungary and Poland. International competition in a liberalizing and increasingly integrated international economy poses new challenges for TNCs... ... with significant implications for countries’ economic performance. Transnational corporations not only create assets and provide privileged access for the individual firms comprising their corporate systems, ... ... but can also provide indigenous firms linked to their systems with advantageous access to the resources available in TNC systems, ... ... all of which can contribute to enhancing the performance of host and home countries in which international production is located. Foreign direct investment also affects the competitiveness of firms by helping them get better access to markets, ... ... creating or expanding, in the process, markets for other firms, ... ... with, again, implications for the performance of host and home countries. Better access to resources and markets also contributes to economic restructuring, facilitated by TNCs, ... ...as exemplified in Asia... ...by the restructuring of manufacturing in Japan by its own TNCs... ...and by that in newly industrializing economies by foreign and their own TNCs, ... ...leading to interactive TNC-assisted restructuring in the whole region. Other regions, too, have the potential to follow Asia’s example.